CoLab Radio » Blog Archive » Love Radio – Episodes of Love and Hate. Love Radio – Episodes of Love and Hate. In 2008, when we were in Rwanda working on a project, we met the team that created a very popular radio soap called Musekeweya (‘New Dawn’). The soap tells a story of bad guys and good guys and the love between two people from opposing villages, but its aim is to help heal the wounds inflicted during the 1994 genocide and to prevent new outbursts of violence. It is broadcasted from the same frequency that in 1994 incited the murder of the Tutsi ‘inyenzi’ (cockroaches). The soap is hugely popular among Rwandans. We were enchanted by this project, and intrigued by the contradiction between the fictional – and at first sight superficial – story of the soap, and the complex reality that many Rwandans still face today. We wanted to make a story about it and felt that it deserved a format through which the audience would really experience these different layers and themes. But how do a photographer and a writer/filmmaker make a project about a radio soap opera, which is spoken in Kinyarwanda? To make the soap understandable we needed to retell it in our own words: with our own images and voice-over. An online documentary seemed the best format to do so. We launched the project on April 7th, exactly 20 years after the genocide started. 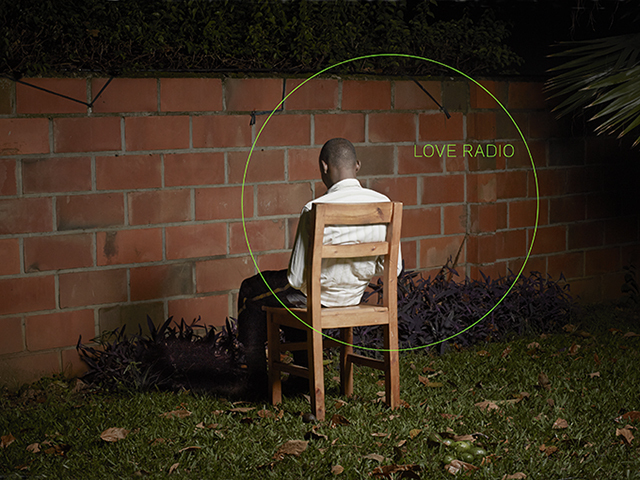 Over the course of the 100 days that follow – the period in which the killings took place – 7 episodes are released on www.loveradio-rwanda.org. We chose this feuilleton-format for several reasons. First, to respect the format of the soap opera. Second, we wanted to see if we could captivate an online audience in such a way that they would subscribe and come back for more episodes. And thirdly, we feel that with subjects like these there is always one media moment (around the 20th anniversary of the genocide) and then we just move on. We want to explicitly use the 100 days that the genocide lasted. We used the thin line between fact and fiction as the structure for the web documentary. It comprises two layers: an upper layer – On Air – and a lower layer – Off Air. The On Air layer retells the story of the radio soap and the message of reconciliation being preached. In the Off Air layer, the soap’s other side becomes apparent: we ask critical questions about the positive image portrayed and uncover what is not said On Air. This layer provides a glimpse into the minds of the actors and listeners of the soap and thus also a peek behind the scenes of contemporary Rwanda. Additionally, the audience can find more information about the different themes of the episodes (such as hate media, identity, justice etc) by way of slideshows and essays. These themes are important because they don’t only apply to Rwanda: issues such as scapegoating, the influence of mass media, and group violence are universal and should matter to us all. The full web documentary experience does not lend itself to be quickly and easily viewed on a mobile phone. Smartphone visitors to the website are therefore redirected to special tappable stories: short stories in photography and text that complement the fortnightly episodes. With a simple ‘tap’, visitors are immersed in an intimate story. And they can easily be shared on social media. Love Radio can be followed on www.loveradio-rwanda.org. New episodes are released every other Thursday. You can leave your email address on the website in order to receive a notification each time a new episode is online. Visitors using a smartphone are redirected to the Tap stories automatically. At the end of the 100-days period, an exhibition will open at Foam, photography museum in Amsterdam, 11 July – 7 September 2014. Post text by Anoek Steketee and Eefje Blankevoort. Post image by Anouk Steketee.